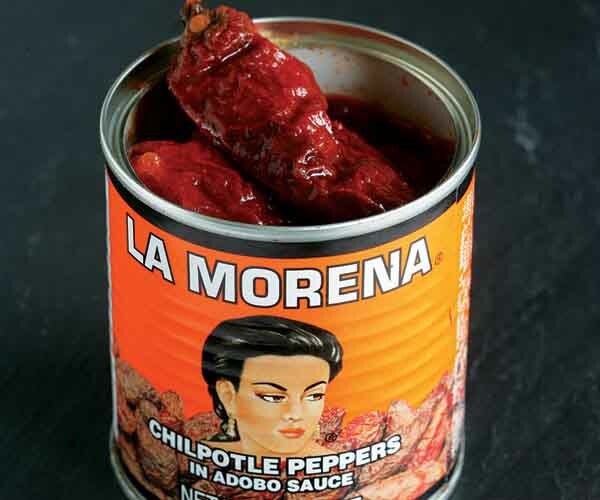 When I want to add a hit of hot, smoky flavor to my cooking, I like to reach for a can of chipotle chiles en adobo. Chipotles are dried, smoked jalapeños. Adobo is a tangy, slightly sweet red sauce. Put them together in a can and they become a versatile pantry staple. You can use just the chipotles for intense smoky chile heat or just the sauce if you want a sour-sweet flavor and a slightly less fiery smoky heat. 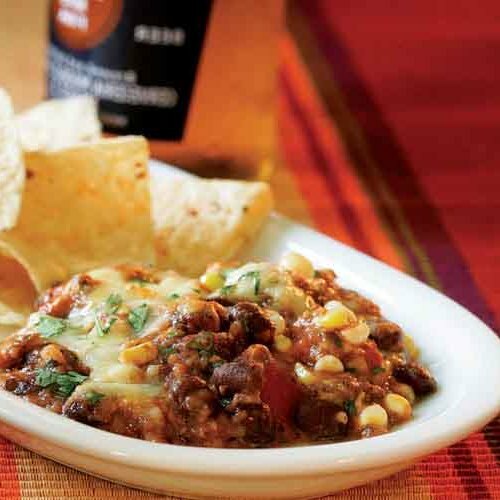 Or you can use them together, as in our recipe for Warm Black Bean & Chipotle Dip. Any Mexican or Latin food market will have them, and many supermarkets carry chipotles en adobo in their Mexican food sections, or look online at EthnicGrocer.com ($2.99 for 7-oz. can). The chipotles are soft and ready to go straight from the can. They can be quite spicy, but you can temper the heat a bit by scraping out the seeds. The size of chipotles often varies, so if a recipe calls for two chipotles and you choose the biggest one, you might want to use just one. Transfer unused chiles and sauce to an airtight container—preferably glass, as the sauce tends to stain plastic—and refrigerate for about a month. Or try freezing individual chiles in an ice cube tray and then transfer the cubes to a zip-top freezer bag. Frozen, they’ll keep for about three months. Start by puréeing the chiles in their sauce—this makes them easier to portion and store. The purée freezes well, too, so if you can’t use it within a week or so, divide small amounts into an ice cube tray, freeze into cubes, and then transfer to a zip-top bag for longer storage—the cubes should keep for about 6 months. Chipotle and honey glazed roast chicken Combine honey with chipotle purée, salt, and pepper. Brush a whole chicken with the mixture and then roast at 425°F. Chipotle-Cheddar twice-baked potatoes Bake russet potatoes until tender. Halve and scoop out the flesh. Mash the flesh slightly, then mix in chipotle purée, butter, sour cream, grated Cheddar, chopped chives, salt, and pepper. Stuff the filling back into the skins and bake at 375°F until heated through. Romaine salad with chipotle ranch dressing Mix mayonnaise, buttermilk, chipotle purée, chopped cilantro, lemon juice, salt, and pepper. Toss the dressing with chopped romaine lettuce and thinly sliced red onion. Top with croutons. Butternut squash and chipotle soup Sauté chopped onion, carrot, celery, and a pinch of salt in oil over medium heat until tender. Add diced butternut squash, a sprig of thyme, a bay leaf, and enough chicken broth to cover by 1 inch. Simmer until the squash is tender. Discard the thyme and bay leaf, and purée the soup until smooth. Combine heavy cream and chipotle purée; stir into the soup, and season to taste with salt and pepper.